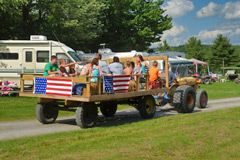 Country Roads has a wide variety of recreational activities for everyone to enjoy. Some of the new 2018 Activities/Events being scheduled are: Irish Festival, a group picnic to a surprise location, a clambake, frequent movies, Slip ’n’ Slide, Father’s Day breakfast, brunches, pot luck supper, a Paint ’n’ Sip party. 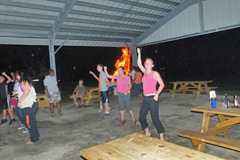 Our regular events like hayrides, giant bonfires, Bingo, children’s games and crafts will still be offered. Dates to follow. September 14-16: Saying thanks to all those Heroes who “Care enough to care for us!” Past and present members of fire departments, law enforcement, medical, military, etc., are 2 invited to camp with a 60% discount. 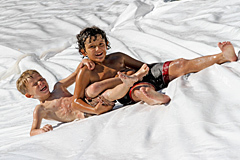 Enjoy paint slip ’n slide, hayride, children’s games and a pot luck supper! Only water and electric and tent sites still available. Call (518) 827-6397 for additional information. September 21-23: Come enjoy steamed clams, salt potatoes and corn! Adults $11.00, children 10 and under $7.00. Reservations required for food count. Call (518) 827-6397 to reserve. As we close for the season we’re saying thank you for camping with us! Enjoy 3 nights of camping for the price of 2. Whirlpool will still be open until Sunday! Call for reservations: (518) 827-6397.